Humic substances are a black to brown, highly functionalized carbon-rich macro-molecule. Bioconversion is accomplished by adapting micro-organisms (derived from termites) to coal in the presence of other appropriate nutrient components. 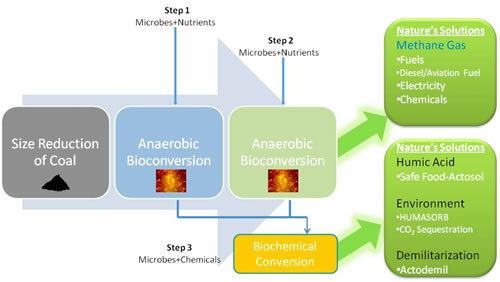 Bioconversion is achieved in a three-step process. Step 1: In the hydrolytic and fermentation process, microbes convert coal into volatile organic liquids. Step 2: The liquid, along with gases that are produced, are contacted with methane-producing microbes that hydrogenate the acetate and CO2 into methane. Step 3: Methane is then separated and unconverted residual coal residue is converted into humic acid that is formulated into agricultural and environmental products. Termites are nature’s engineers. Our microbes have been bio-engineered from the gut of termites. Microbes were first discovered in 1675 and are very diverse. Microorganisms are vital to the environment, as they participate in the Earth's element cycles such as the carbon cycle and nitrogen cycle, as well as fulfilling other vital roles in virtually all ecosystems, including recycling other organisms' dead remains and waste products through decomposition. Plants and coal are the products of photosynthesis. The carbon they contain was once CO2 in the air. Burning plant bio-waste or coal returns the CO2 to the air and defeats attempts at carbon sequestration as a remedy for global warming. Because it is a multifunctional material, humic acid has the ability to remove both inorganic and organic contaminants from wastewater. This approach has been used by the Company’s clients for more than 15 years to decontaminate and recycle wastewater for agricultural use in several countries where the only alternative is lifeless drought. The patented Arctech Process is a breakthrough approach for converting coal into methane gas and humic acid products. Natural microorganisms are adapted to digest coal under anaerobic conditions (i.e., living or active in the absence of free oxygen), resulting in a biogas mixture of methane and CO2. Methane gas can be separated from the CO2 to produce a gas equivalent to natural gas. Unconverted coal from the anaerobic digester is subjected to a biochemical process for the extraction of high value, carbon-rich humic acid products. Technologically, this process is similar to that used in oil refineries. A barrel of crude oil, as a result of cracking and refining, provides various byproducts valued several times higher than the price of the crude itself. Similar to the cracking and refining of oil, the Arctech Process results in the complete utilization of coal without any waste byproducts.